A few years ago, the IGGPRA Board committed to increase the number of Seminars and align the topics to the grape growing cycle. We’ve been successful with that approach and typical attendance ranges for 40-80; member and non-members alike. In 2017, we determined that there were many topics and issues in the grape growing business that were not necessarily related to the growing cycle but of interest to our members. While we always try to have at least one speaker for the grape growing process at each seminar, we are also trying to bring topics that will expand our members understanding of other aspects in the wine and grape growing market. 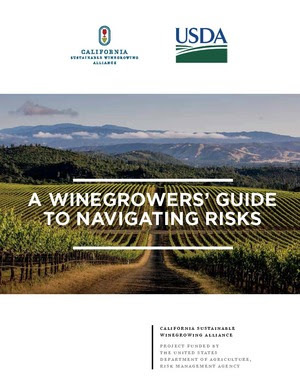 Participate in this free webinar to learn about the California Sustainable Winegrowing Program (SWP), how to complete a Self-Assessment using the SWP Online System and the steps required to become Certified California Sustainable Winegrowing (CCSW). The Performance Metrics project and online metrics tool will also be covered. The past four years of drought and the large amounts of poor quality water has had a devastating impact on some of the older vineyards. I am seeing some now that will not come back, others with normal rainfall and not only for one year may take a couple years to recover. With the increase cost of labor and chemical etc. and now the water issue and the possibility of a very expensive water district. This is not a recipe for the survival of a grape grower. The winery’s and growers need to have a better understanding of each other’s needs; growers will not survive with the current prices for wine grapes. An example at 3000 dollars per ton the wine in a bottle is 4.30, glass, corks, capsules, labels and wood for aging 3.50 = 7.80 per bottle and then sold for fifteen to eighty dollars a bottle and some even more. CROP INSURANCE IS A USDA SUBSIDIZED PROGRAM THAT IS SOLD AND SERVICED THROUGH APPROVED PRIVATE INSURANCE COMPANIES AND THEIR APPOINTED AGENTS. ALL PROCEDURES AND RATES ARE DETERMINED BY THE USDA’S RISK MANAGEMENT AGENCY (RMA). ALL COMPANIES MUST USE THE SAME RATES AND FOLLOW THE SAME PROCEDURE. Damage to your crop from adverse weather conditions (frost, heat, excessive wind, hail, etc), insects, disease and wildlife are all covered causes of loss. Thank you everyone who joined us at September’s Seminar- we had a great turn out and learned a lot from our 4 speakers. Thank you also to Vina Robles for letting us hold the seminar at their winery. For those who couldn’t make it we are happy to share with you the presentation slides from the NRCS and Dr. Lowell Zelinski. This is going to an interesting season. Bud break was as early as I have ever seen it, up to 3 weeks ahead of normal. Will this lead to an early harvest? It is too soon to say, but I expect that it will. One thing for sure is that it has led to an early bloom with many blocks of chardonnay and pinot already blooming. Remember that bloom is the optimum time to take petiole samples and for many growers petiole samples should be taken in the next couple of weeks.